Leading record label founder Daniel Miller has been appointed by Middlesex University as a visiting professor of music – he started the role by giving students a music masterclass and tips on how to start a record label. The visiting professor of music role, which is a three year appointment, will see Daniel sharing his years of experience as a musician, record label boss and artist with Middlesex University's music students on all music related courses. 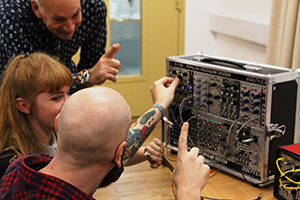 During his first visit to the University Daniel gave eager music students, many using a modular synth for the first time, a lesson in the electronic instrument which has become synonymous with Daniel's work. 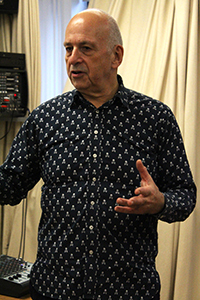 Daniel Miller, founder of leading record label Mute, also gave a group of students expert advice on setting up a record label, a project which the group are undertaking. 2nd year Music Business and Arts Management student Alli Macinnes said: "The guy is a legend, it's nice to be able to ask questions to someone of his standing." Mr Miller's Mute label boasts a long history of number one chart successes - in the UK and around the world - and works with some of the biggest names in the music business. Started in 1978, the company has grown into an international business with an artist roster that includes Goldfrapp and Erasure. Other famous names who've signed with the label in the past include Depeche Mode and Moby. Daniel Miller said: "I really enjoyed spending the day with the Middlesex University students. I hope they will be inspired to explore modular synths more and experiment. I loved watching them, I just set them up and they got on with it." Middlesex University Lecturer in Arts Management Dr Zuleika Beaven said: "We are delighted to have Daniel Miller join us because of his expertise not just as a label boss, but as artist, producer and DJ. Daniel's first visit has been a great success and students have really valued the opportunity to work with such an important figure in the industry. "Daniel's a natural teacher. He's been showing complete beginners and more experienced musicians alike how to get amazing sounds out of modular synths. "We are really looking forward to the opportunities students on all our programmes will have to work with Daniel over the next three years."